We are off on our latest adventure, this year traveling to Wisconsin via Indiana in search of (in no particular order) beer, ice cream and cheese. For the next two weeks, we’ll be reporting and riding from many different cities and states as we combine our two favorite activities: eating and cycling. We leave Atlanta right after work on Friday as we have almost 700 miles to travel to our first destination. Our first stop is dinner in Cleveland, TN at the Bald Headed Bistro. This place comes highly recommended by our foodie friends TT and CT.
As we walk in, we instantly smell with the smoky odor of the wood-fired grills in the kitchen. Someone is cooking some fine-smelling meats and we can’t wait to get some food. Because we are driving, we have to skip the beer list, which includes some local beers from the Chattanooga area. We decide to get an appetizer, a salad, a small plate and a side order. 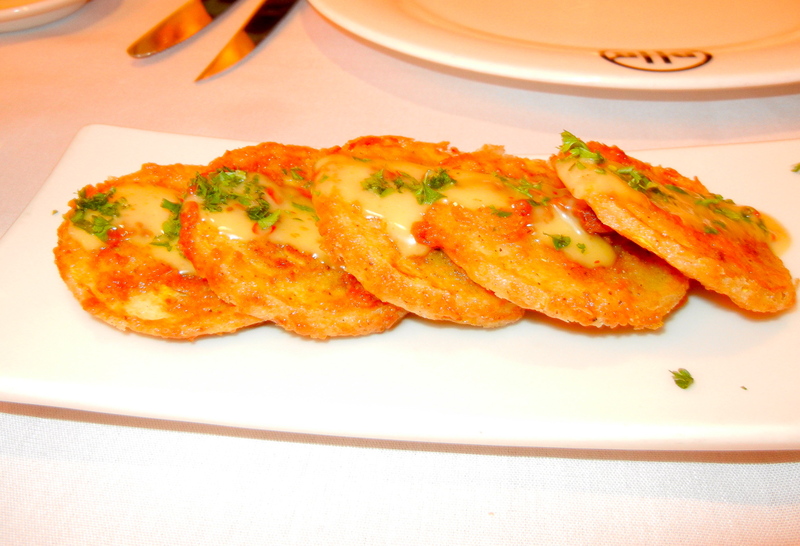 We start off with some fried squash, which our server Mallory tells us was just picked from a local farm. The breading was amazing and these didn’t last long. Next up, the caprese salad with fresh mozzarella and roma tomatoes. 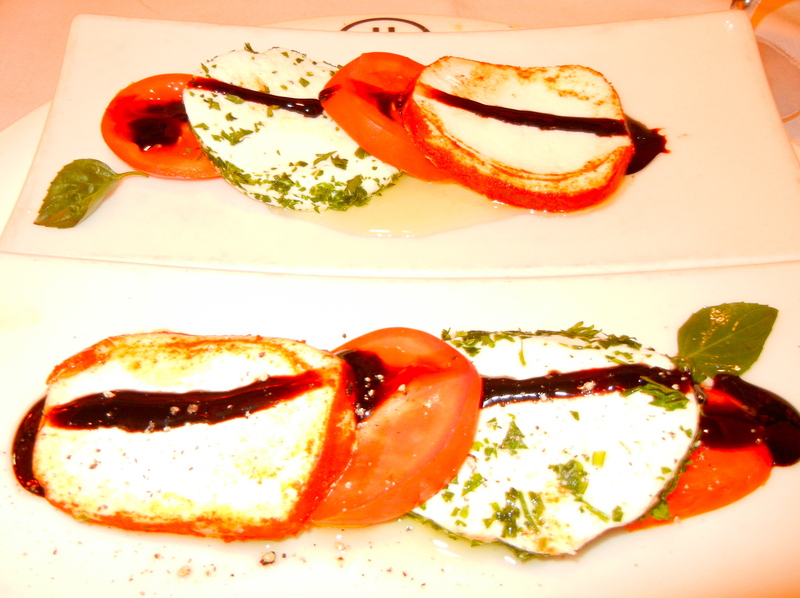 Caprese salad with fresh mozzarella and tomatoes. They split the order for us, so that’s why we show two plates. 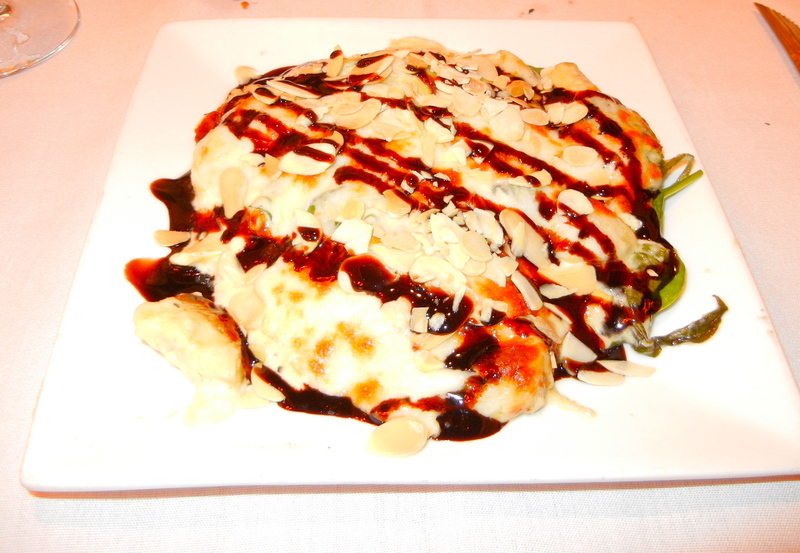 The cheese was wonderful in the dish with one piece slightly smoked and the other one plain. 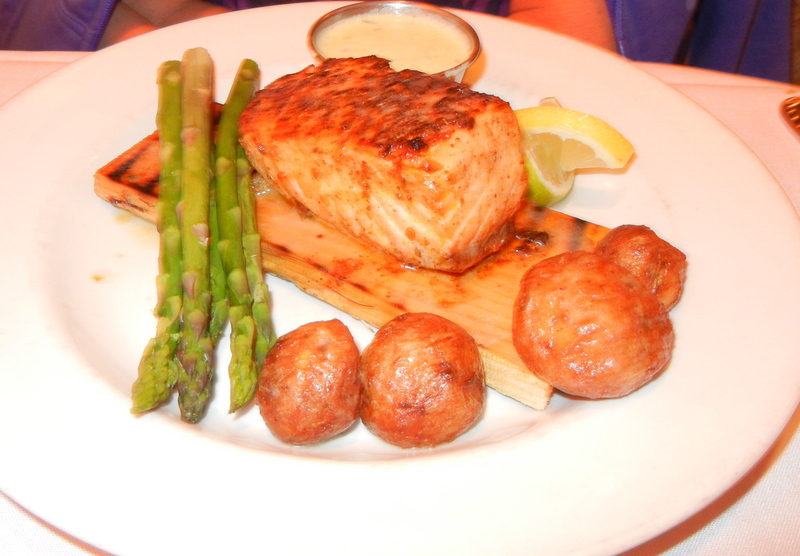 For our small plate we order the wood-planked salmon with a side of stuffed portobello mushroom. The salmon is cooked to perfection and the mushroom is sinfully stuffed with a cheesy-gooey mixture of spinach and artichokes. Even though we will not ride until Sunday, Mallory gushes so much about the fresh peach pie that we must get a slice. 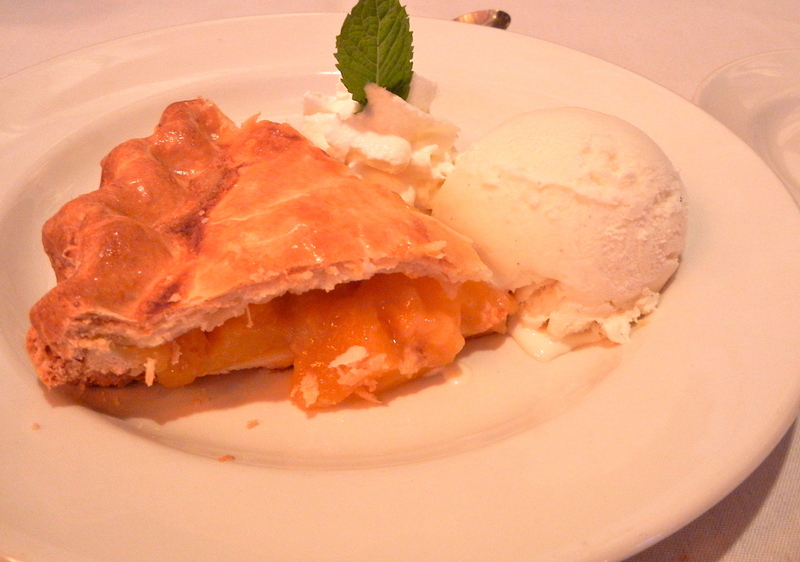 Fresh peach pie, with ice cream, of course. We leave the Bald Headed Bistro with smiles on our faces. We shake our heads and wonder what a place this good is doing in Cleveland, TN (about 30 miles west of Chattanooga), and we are so glad that we are now “in” on the secret of this gem of a restaurant. We drive for another 150 miles and hit our overnight destination, the Hampton Inn in Williamsburg, KY. It’s a brand new Hampton and it’s a Hampton “palace”. Best of all, it’s right across the street from the Wal-Mart, so we pop in to pick up some things we were running low on. It’s the size of a small city and we are quite entertained by the “people of Wal-Mart”. Evidently, this is the hot spot to go in Williamsburg on a Friday night. We depart on Saturday morning with about 450 miles to drive. 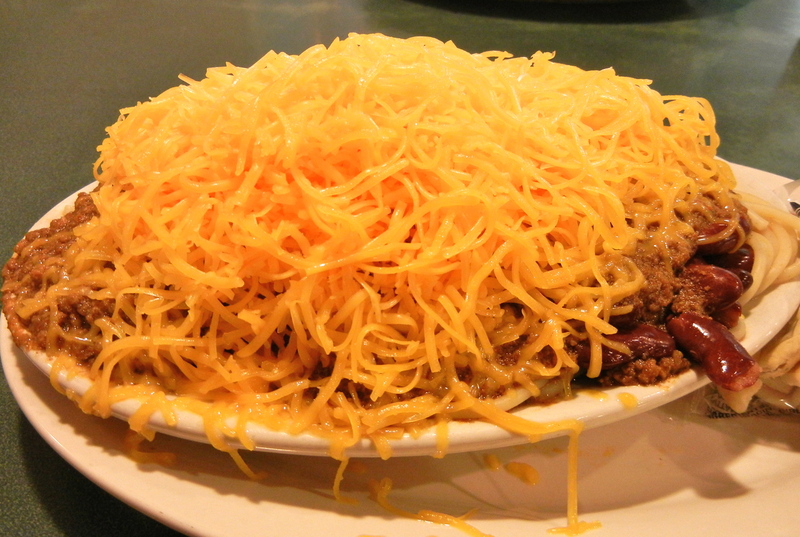 Our drive takes us through Cincinnati, and when in Cincinnati, you must eat at a chili parlor. We do some internet research in the car (how did we find anything in the old days?) and come up with a chili house that’s pretty close to our route through town. We pull up to it and, lo and behold, they are closed until the middle of July for “vacation”. Everyone deserves a vacation, but most restaurants don’t shut down in the middle of the summer for one. That’s OK, we do some more car research and come up with a Plan “B”, which takes us five miles to our next attempt. This one is successful, and we get our chili. When in Cincy, you gotta eat what the natives eat. The restaurant is full of regulars, most of which are “chili poisoned”. One woman next to us orders two chili cheese dogs and a huge order of chili cheese fries. This explains her figure, but she did look like she was enjoying herself. The rest of our trip is pretty uneventful, but you can’t get to Middlebury, Indiana from the south. We spent a long time on non-interstate roads, but it was the scenic route. We are in the middle of Indiana Amish country. Our faithful readers will remember that we spent a week last year in Pennsylvania’s Amish country, so on our way to Wisconsin, we will spend three days in the Indiana version. Already we see a lot of similarities. There are wide roads for the Amish buggies and there’s horse poop all over the roads. We can deal with that because we like the wide roads so much. It’s Saturday night and we hit a local Italian restaurant and share a nice Italian sampler plate of lasagne, stuffed chicken breast, tortellini, and spaghetti. We must have been hungry because we forgot to take a picture of our food. It’s Sunday morning, and everything in this area is closed on Sundays. Everything, but our bike, which we roll out of our tandem hauler and finally get some exercise. 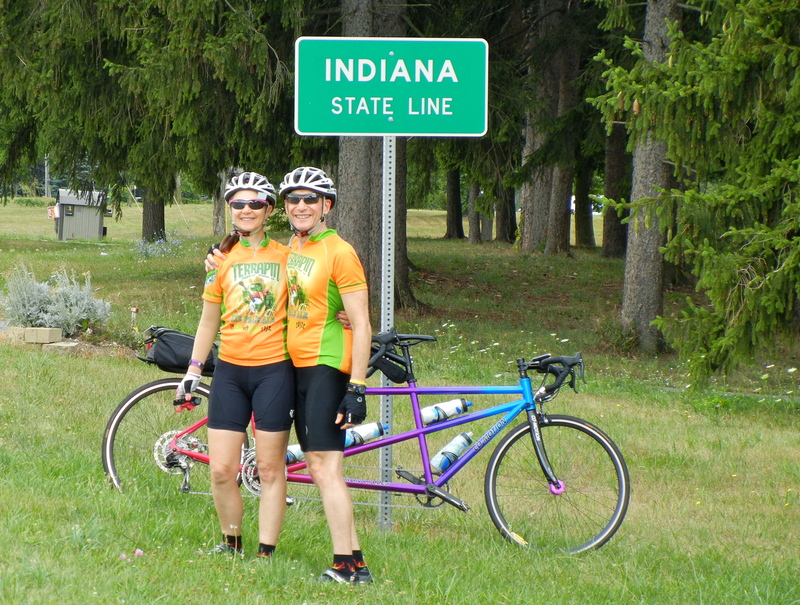 We are headed to Michigan, because for some reason we think it’s cool to cross state lines on a bike ride. The terrain is pretty flat in this part of the state, and the few hills that we do encounter are easy ones. We get out of the big chain ring only a couple of times the whole day. When we arrived on Saturday, the temperature was 104 degrees. Overnight, the heat wave has vanished and it’s cloudy and 75 at ride start. We stop at a park to use what our friend NvN calls the “flushies” and it turns out there is a photo opportunity. Photo op at an old mill. 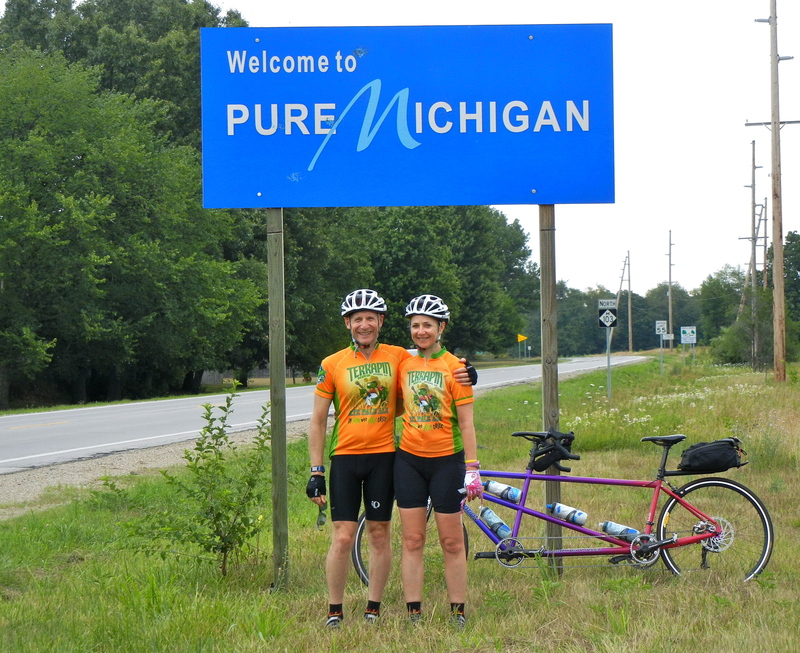 We finally hit the state line and ride about 20 miles in Michigan. And then back home again in Indiana. 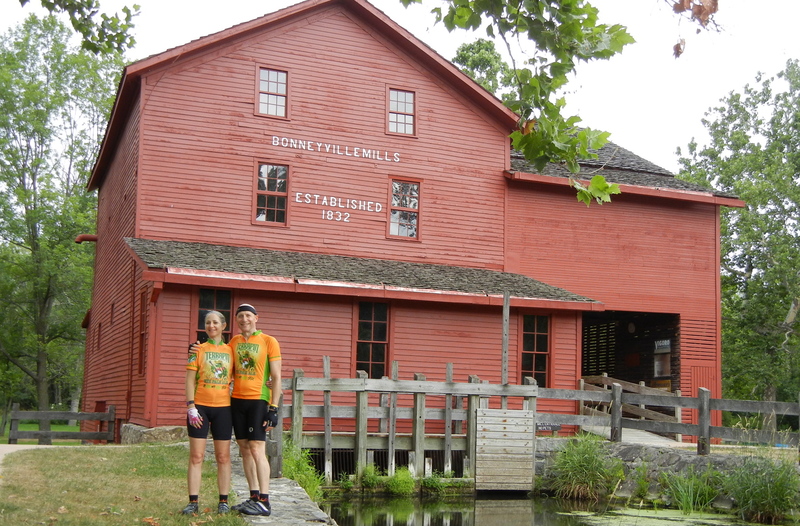 Our original ride calls for 40 miles as we did not know what the terrain would be like, but we are feeling good at the end and decide to extend another 12 miles into Shipshewana via a newly paved bike trail. Shipshewana is really the capital of this Amish area, and it is a ghost town on a Sunday. We’ll be back here when everything is open. In fact, this entire county is closed, but the Hilltop restaurant across the street from our hotel is open and after 53 miles, we are hungry. Four-egg omelet with asparagus, mushrooms, and bacon. Stuffed pineapple with tuna salad. 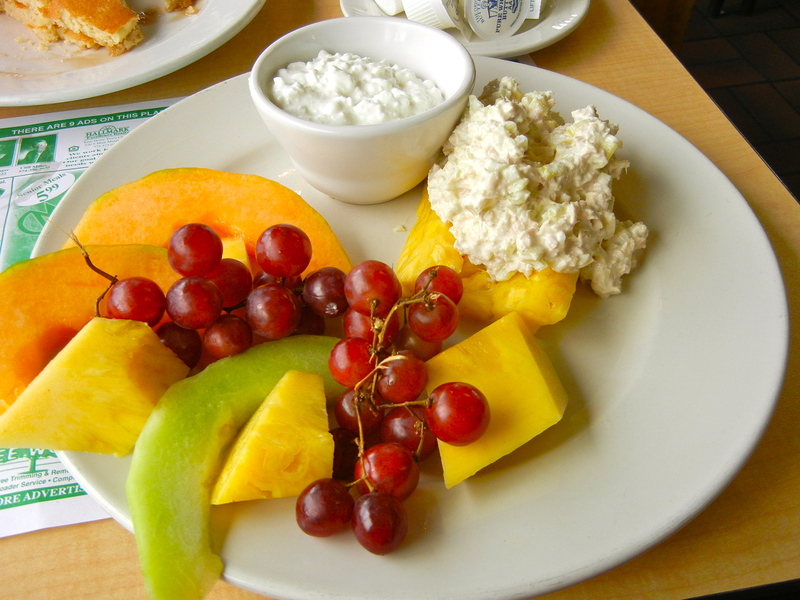 We have finally earned our food, and Eve is the one who eats healthy. This is a ton of food, and it’s only $16 for the both of us. 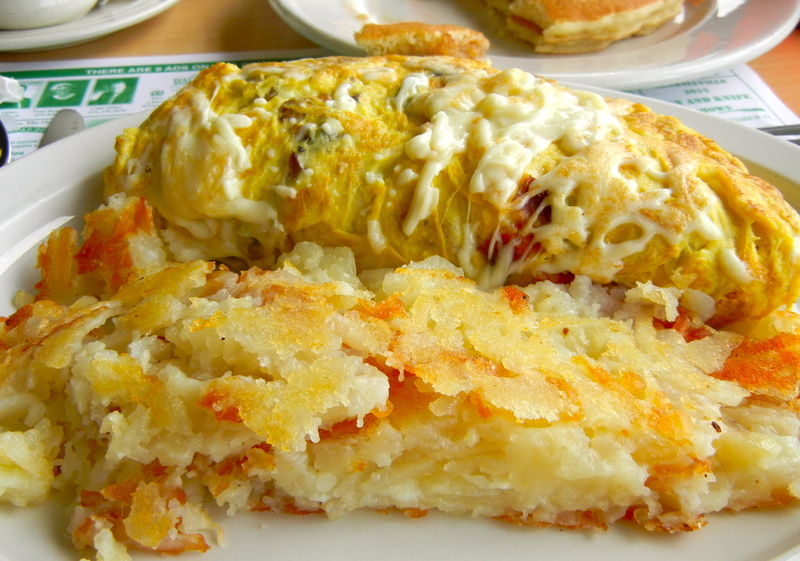 Lots of food, and cheap–who can argue with that? 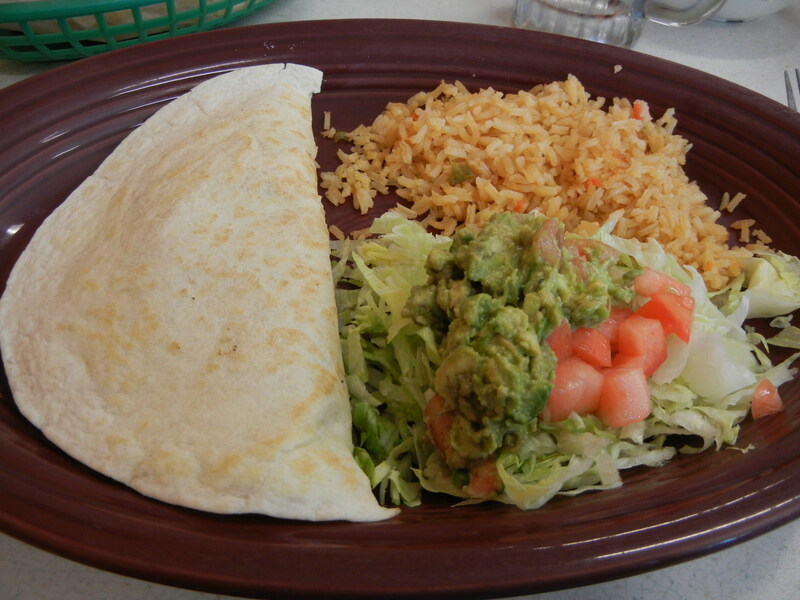 And speaking of lots of food, we find the only other open restaurant, which of course is Mexican. We walk the two miles to dinner so we can have some beer. 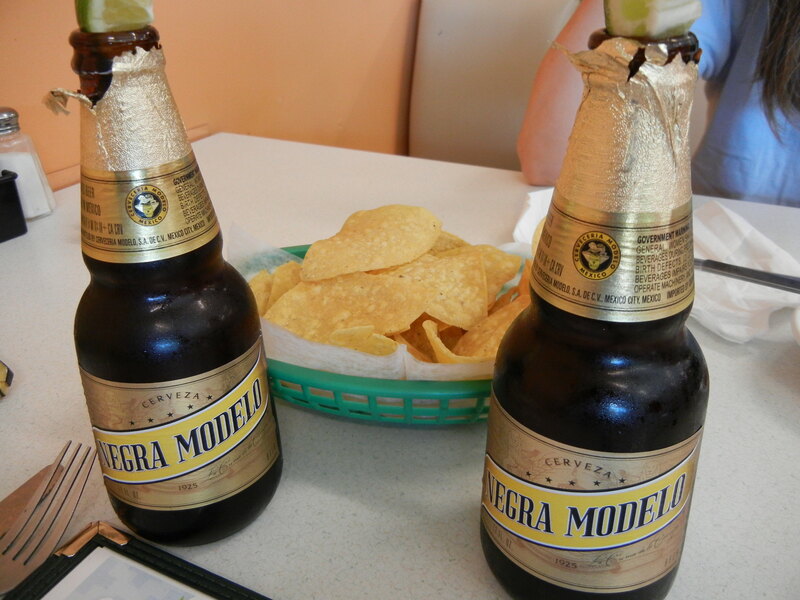 We hope for some good beer, (sorry, but Corona is not good beer) and are pleased to find some Negra Modelo, the winner our recent ,BRAG beer-off is on the menu. Our first beers of the trip are nice and cold (and unfortunately not local), which is good after that two-mile walk. 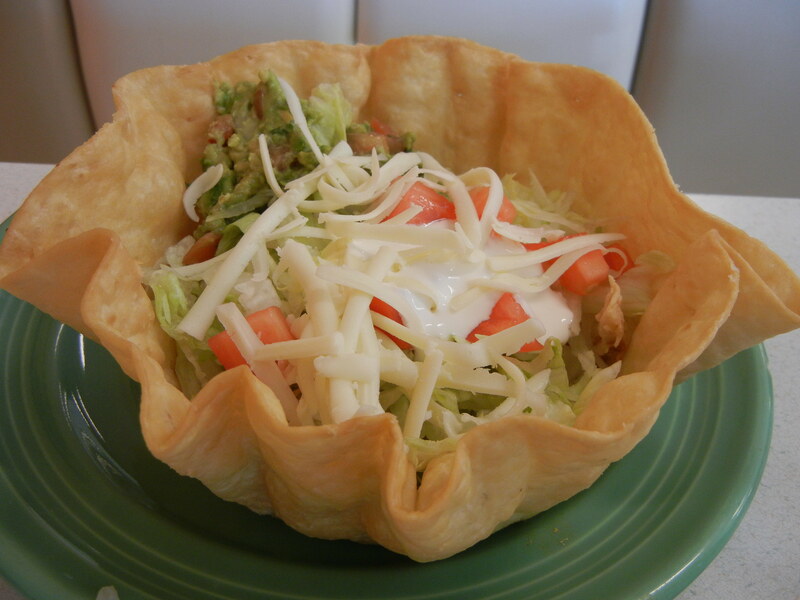 Since we have gone on way too long (future posts will be much shorter), here are a couple of pics of our dinners, a taco salad and a chicken quesadilla. We head for our hotel after dinner, full and tired, and ready for Day 2, when everything in the area will actually be open.